The mistakes you make when trying to lose stubborn body fat often leave the individual confused as what to do next. Unfortunately, we are easily misinformed by the conflicting information that the media tells us. They are usually trying to sell a quick fix solution to a problem which never works. Instead, focus your valuable time and attention on what the credible experts in the health and fitness industry have discovered, if you really want to lose stubborn body fat and thin out. My solutions to mistakes you make when trying to lose stubborn body fat are first a generalized solution and then broken down into gender specific solutions. Start with the basics and get a profile of your hormones– As we age hormone status does a nose dive and leads to weight gain. For men, it is usually serum testosterone and for women, it’s estrogen, estradiol and testosterone. This is best accomplished with a hormone specific metabolic panel ordered by your personal physician. This test is valuable and a “must know” in order to lose stubborn body fat. Food quality and quantity – Not only does the amount of food you eat cause you to gain weight, but nutrient deficient food quality can throw off your body’s hormonal balance and metabolism. Lack of hydration – As we age the hypothalamus in the brain changes and causes us to drink less. Fight this issue and drink 1/2 your body weight in ounces per day of good quality spring water, not tap water. Proper hydration has been scientifically proven to raise your metabolism and detox your body. The solution to body pollution is dilution! Inadequate sleep – Your circadian rhythm for sleep is designed to physically repair the body, and psychologically repair the brain. Yes, science has determined that between the hours of 10:00PM and 2:00AM the human body is in physical repair, and between the hours of 2:00AM and 6:00AM the brain creates new brain cells and neuronal inputs which enhances cognition and reduces stress. Moreover, science has shown that growth hormones are almost non-existent in sleep deprived individuals who are coincidently clinically obese. Stress management – Stress causes glucocorticoids to attack the body and selectively effect bone, muscle and organ function. Glucocorticoids will also make you fat. How will you approach your stress levels? What can you change about your current lifestyle that is causing undue stress. Don’t overlook this weight loss variable. Women are unique yet complex in many ways. Biologically made to bear offspring, they naturally have a higher percentage of body fat then men. However with a great diet, movement lifestyle factors in check, women can acquire a lean athletic build, and look and feel great. There are many factors that can undermine good intentions for female body fat loss that will now be addressed. Hormone status– Women have a higher ratio of lipogenic hormone versus lipolytic hormone than men. Therefore, women’s fat loss must be addressed differently. Women produce a greater level of fat producing hormone then men and therefore must be careful in both food and exercise choices. Too much cardiovascular exercise will cause a women to actually add fat to her body as a protective mechanism. Cardiovascular exercise will spur the lipogenesis or a fat producing hormone. Resistance training has been scientifically proven to increase the fat burning lipolytic hormone lipase in women, therefore lowering the lipogenic fat building hormone in women. In summary, more weights and less cardio makes Jane’s physique lean. Aging – Peri-menopause, menopause and post-menopause life stages affect estrogen, estradiol and testosterone norms in healthy women. It is my policy to work directly with my client’s physicians to ascertain that thyroid levels, and hormone levels are optimized prior to changes in diet and exercise. if this variable is left unchecked, the probability of weight loss is minimal. Hormonal regulatory mistakes you make when trying to lose stubborn body fat will certainly frustrate the middle aged woman. Food Choices – A sugar ladened diet is a sure fire way to upset a woman’s hormonal equilibrium. 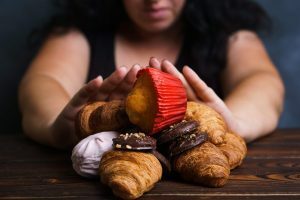 Too much glucose from sugar causes glucose impairment which leads to a decrease in your lipolytic or fat burning hormone, and an increase in insulin, your fat storage hormone. Remember women biologically have less of this lipolytic hormone then men, so too much sugar will get you fat not fit. Beware the white devil sugar. Men are not nearly as unique as women. Generally they are stubborn and resistant to change especially when it comes to restrictive dieting or taking a holistic approach to total body wellness. Keeping this in mind, mistakes you make when trying to lose body fat will require a different strategy approach. Dietary intake – Limit your caloric intake. 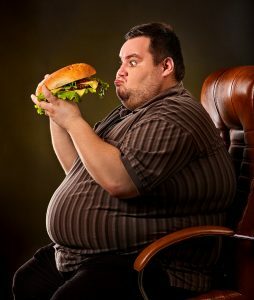 If you are a fat 300 pounds, then consider eating your body weight multiple by 10 in calories as a weight reduction start. So if you weigh 300 pounds, your baseline starting calories are at 3000 calories per day. Once your body adapts to this limit, consider reducing calories by 5%, then in the future 10%. Weight loss will follow. Food choices – Organic clean foods that are ancestral based are certainly better for a man’s testosterone stability. Like women, sugar should be minimized or avoided. Water intake should be 50% of your total body weight in ounces per day. The water should not come from tap water but from spring or aquifer sources. Alcohol should be limited to the weekend only and in moderation. Too much alcohol leads to fatty liver disease, metabolic drop out, and the classic beer belly. It’s a well known fact that men’s addictive behavior to drugs or alcohol is more prevalent than women’s. Hormone status – Men go through Menopause by age 45 like women. The effect is low testosterone, which raises body fat levels and muscle tissues low. Unfortunately the more fat acquired around the viscera of a man the lower the testosterone levels drop. Research has shown that excess abdominal fat alone even at a young age can significantly lower serum testosterone. A visit to your primary care physician with the appropriate lab testing will determine what your baseline serum testosterone levels are. There are viable solutions to low testosterone, such as testosterone jelly, implant beads or injection therapeutics. In my opinion the holistic approach is the best way to raise testosterone naturally. All my low testosterone male clients overcame their hormone imbalances with consistent exercise in the form of resistance training. Research has shown an 800% increase after a really good leg workout. Check out this article in Mens Health. The Male Advantage – Men will lose weight rapidly with weight training alone and very little dietary intervention. It’s so unfortunate for women to experience this when working out with their husbands. This is a fact related to hormone integration and exercise. Men can raise their testosterone effectively though exercise alone. Woman can but not as much. Although, if a man wants to take their physiques to a higher level then a good dietary protocol and lifestyle intervention is required. About the Author: Rivak Hoffman is an avid writer with a keen interest in holistic health and total body wellness. He is the owner of Every Bit Fit Arizona located in Scottsdale, Arizona. He is Scottsdale Best Personal Trainer, Holistic Lifestyle Coach, Nutritionist and CHEK Practitioner. He is the number one solution to all your health and fitness needs. To contact him for a complimentary consultation visit the EVERYBITFITAZ website. Or call 480-868-5170 today!